Reliable 24X7 availability of electricity is taken for granted in most of the developed world. Whenever consumers plug their favorite gadgets into the wall socket, it is assumed that the power will be there. Everyone has access to it. Electrical power outages are extremely rare. Electricity empowers consumers by enhancing their lives through better learning and entertainment, higher productivity and income, greater comfort, increased safety, superior health, and improved economy. People in the developed world live with the benefits of electricity everyday. While most people give little thought to where electricity comes from, there are many different ways to generate electricity - including coal, oil, gas, hydroelectric, nuclear, wind and solar. It is delivered to individual homes by extensive national grid systems. In most of the developing nations, however, the availability of electricity to majority of the population is either unreliable or non-existent. The lack of such an essential energy source results in low levels of human development, low productivity and widespread poverty in the developing world, as evident from the chart above. The governments of most developing nations, particularly in South Asia, have miserably failed in providing such a basic necessity as electricity to their people. About 40% of the people in both India and Pakistan have no access to electricity, The percentage lacking access in Bangladesh is even higher. Socially-oriented enterprises such as Grameen Shakti and D.light are offering poor communities an affordable alternative to kerosene, which is ubiquitous but hazardous. The quality of the kerosene lamp light isn't good, it emits pollutants, and it's just plain dangerous. "You travel around these villages, and everyone has a story of a child being burned or a house destroyed by fire," says Nedjip Tozun of D.light, speaking to Fortune by phone from his office in Shenzhen, China. "And yet in some places we found that people were spending 15% to 20% of their income on light." The world's poor spend about $38 billion a year on kerosene for lighting, according to the International Finance Corp.
Pakistan's current installed capacity is around 19,845 MW, of which around 20% is hydroelectric. Much of the rest is thermal, fueled primarily by gas and oil. Per capita energy consumption of the country is estimated at 14 million Btu, which is about the same as India's but only a fraction of other industrializing economies in the region such as Thailand and Malaysia, according to the US Dept of Energy 2006 report. To put it in perspective, the world average per capita energy use is about 65 million BTUs and the average American consumes 352 million BTUs. Extended electricity load shedding in Karachi's five major industrial estates is causing losses in billions of rupees as the production activity has fallen by about 50 per cent. KESC, Karachi's power supply utility, is dealing with with a shortfall of around 700MW against a total demand of 2200MW. Almost all forms of power generation from fossil fuel-fired thermal to hydroelectric to nuclear are down from a year ago. As a result of the daily rolling blackouts, the economy, major exports and overall employment are also down and the daily wage earners are suffering. The KESC and PEPCO owe more than Rs. 10b to the independent power producers (IPPs) and paying them will help bring them into full operation and ease the crisis at least partially. The electric power situation in India is not much better. The country is suffering its worst electricity crisis. Maharashtra, Uttar Pradesh, West Bengal and Haryana are the worst hit by the ongoing crisis and they are facing power gaps of about 5,000MW, 1,000MW, 2000MW, 1,500MW respectively. Some major cities in India are facing alarming situations; continuous load shedding in Bangalore has led to diesel shortage as people are using diesel generators to deal with the crisis. Times of India has reported student protests against power cuts affecting their studies. Textile and jute mills in West Bengal have been badly hit by unscheduled power cuts. In Tamil Nadu, severe power shortage has hit industrial production, according to MSN India. Companies said production could be down as much as 30 per cent. Sectors like textile, leather and salt appear to be among the worst hit. Industry associations put the loss in production at around Rs 4,000 crore. In Maharashtra, state officials are asking industrial consumers to lower their demand by 10% or be ready to face forced load shedding (rolling blackouts). Last year, IBN reported that New Delhi, the capital, faced 30 percent shortage in power. Maharashtra on an average had 8 to 10 hours of load shedding every day. Madhya Pradesh had 26 percent power deficit. In Gujarat, while the requirement is 5,500 Mega Units, availability is 4,780 Mega Units. Andhra Pradesh, Karnataka and Tamil Nadu are facing 2000 Mega Units of energy deficit and Bihar and Jammu and Kashmir have 1,500 and 1000 Mega Units of power shortages respectively. Cities and towns are facing 7 to 13 hours blackouts. To empower people and communities in some of the developing nations, social entrepreneurs are stepping in to fill the large gap between supply and demand for electricity. In Bangladesh, for example, Grameen Shakti is a social enterprise selling home solar electricity systems to families that do not have access to electricity otherwise, which includes more than 70% of the country’s population. It is an enterprise that demonstrates the success of a densely networked approach involving mutually reinforcing investments in human, social, ecological and financial capital by a number of organizations. Solar energy makes much sense for Pakistan for several reasons: firstly, majority of the population lives in 50,000 villages that are far away from the creaking old national grid, according to a report by the Solar Energy Research Center (SERC). Connecting these villages to the national grid would be very costly, thus giving each house a solar panel would be cost efficient and would empower people both economically and socially. To draw inspiration for empowering Pakistani villagers with solar energy, Pakistanis don't have to look far. In Bangladesh, Grameen Shakti (GS) is demonstrating that it can be done. GS was founded by Bangladeshi Nobel Laureate Mohammad Yunus in 1996 as part of the Grameen Bank’s family of enterprises. Shakti is attempting to rescue the rural people from energy poverty which hampers their social and economic development. Shakti's unique program has taken the first step to break the social and economical divide between those who have energy and those who do not. The Grameen Bank, based in Dhaka, Bangladesh, was started in 1976 and officially founded in 1983; it operates on a model of providing small loans without collateral to the rural poor in Bangladesh. 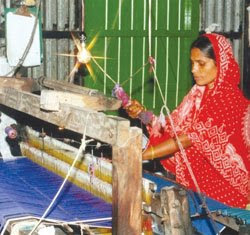 Grameen Shakti is one of more than two dozen organizations within the Grameen family of enterprises that is dedicated to improving the quality of rural life in Bangladesh. Although registered as a not-for-profit organization, Grameen Shakti is run like a business. In the face of persistent market challenges, the organization achieved profitability in 2000, after only four years of operation. Grameen Shakti has installed more than 40,000 individual solar energy systems that have provided more than 100,000 lower-income individuals with access to reliable electricity. GS’s solar program mainly targets those areas, which have no access to conventional electricity and little chance of getting connected to the grid within 5 to 10 years. It is one of its most successful programs. Currently, GS is one of the largest and fastest growing rural based renewable energy companies in the world. GS is also promoting Small Solar Home System to reach low income rural households. Solar Home Systems(SHSs) can be used to light up homes, shops, fishing boats etc. It can also be used to charge cellular phones, run televisions, radios and cassette players. SHSs have become increasingly popular among users because they present an attractive alternative to conventional electricity such as no monthly bills, no fuel cost, very little repair, maintenance costs, easy to install any where etc. Grameen Shakti has a micro-utility model for some very poor rural consumers who cannot afford a complete solar home system. Under this model, one entrepreneur installs the system at his own premise and share the load with some of his neighbors. Owner of the system is responsible for making installment payments to GS, more than 50% of which is covered by the rents he collects from the users of his system. Micro-utility model has become very popular in the rural market places and has helped to increase business turnover by extending business hours. More than 1000 micro-utility systems are operating in the rural market places. GS installed SHSs have made a positive impact on the rural people. GS has introduced micro-utility model in order to reach the poorer people who cannot afford a SHS individually. Another successful GS venture is Polli Phone which allows people is off grid areas the facilities of telecommunication through SHS powered mobile phones. Pakistani blog Pakistaniat has reported practical examples of the use of solar energy as seen in some villages of Pakistan where each house has been provided with a solar panel that’s sufficient to run an electric fan and two energy saving bulbs. Prior to this arrangement, the whole village used to go dark at night. In Narian Khorian, a village about 50 kilometers from Islamabad, 100 solar panels have been installed by a local firm, free of cost, to promote the use of solar energy. With these panels, the residents of 100 households are enjoying light and fan facilities. This would not have happened for decades as the supply of electricity from the national grid would be difficult and costly due to the mountainous terrain. Dawn newspaper recently reported that the Alternative Energy Development Board is planning electrification of 6968 remote villages through solar photovoltaic (PV) systems in the next 20 years. All the renewable energy projects, being undertaken by AEDB in the country, are financed by federal government through public sector development program (PSDP) allocation and funding from international multi-lateral institutions. Among private non-government initiatives, a number of community-based micro hydro projects are being executed with the help of the Agha Khan Foundation in Pakistan's Northern Areas and NWFP. Within this region, out of a total of 137 micro-hydro plants, the AKRSP has established 28 micro-hydros with an installed capacity of 619kW. Initially, in 1986, these plants started as research and demonstration units. These projects were extended to Village Organizations (VOs) and became participatory projects. A Village Organization (VO) is a body of villagers who have organized themselves around a common interest. Shakti Solar offers a very good model for organizing and funding a larger, nation-wide effort to empower Pakistanis with electrical energy to improve their lives. Last February, I wrote an article "Solar Energy For Sunny Pakistan" suggesting that Pakistanis should seriously pursue the solar energy option. Many of the comments on the post were quite skeptical, some even cynical. But one particular response elated me. It was posted by someone with initials SK, who wrote as follows: "I am a consultant for the World Bank and I work on energy and infrastructure development issues. I am in the process of leaving and starting a non-profit organization to replicate the Grameen Shakti solar pv model in Pakistan because it is the only project I ever reviewed that seemed to make a bit of difference in actually alleviating poverty". I do hope SK is out there now trying to light up a few homes in Pakistan to empower people. I wish SK, and others like him, great success as social entrepreneurs in Pakistan. It is indeed better to light candles than to curse darkness. No wonder a lot of pakistans are trying to buy solar panels from us.They want dirt cheap ones though. i agree. There is going to be a major shortage of power in india. India is looking at nuclear power to handle the shortage and ameirica is looking at this problem as an opportunity to dump reactor worth 60 billion usd. With obama and change in government in india, we will have to see how it take up . If the scheme envisages providing solar panels for free and then maintaining them also, it will work. However, the proponents should also be prepared to face villagers complaints and protests when there is no sun and no electricity in which event they may even try to burn the offices. So extra police force will also be needed. Pakistan's villagers do not have the culture of paying for electricity or of repaying debts, so Grameen or non-profit style will not work; it has to be on a charitable basis. Had it been otherwise, Pakistan would have been a different society altogether and villagers would have been useful human beings not the useless lot as they're now. Grameen model is not charity. Nothing is given for free to anyone. It's based on micro loans and training of villagers. It's a self-help model. And it has worked well in Bangladesh. I see no reason why it won't work in Pakistan. I am more hopeful. My comments about Solar and wind electrical power are still the same -- they aren't price-competitive. It is far cheaper to run a grid to the Khorian village you talk of and provide to each home dependable power. A dependable grid is what Pakistan must give. Solar and wind are run by the will of God, and that is where it all goes to hell. Suhail has been a consultant for wind systems in Pakistan. He knows. I told him so. Given the massive failures of Pak governments, do you still believe they'll do anything to provide electricity to remote villages? They can't even keep lights on major cities. Had it been otherwise, Pakistan would have been a different society altogether and villagers would have been useful human beings not the useless lot as they're now. Suhail my man, interesting take. Pakistan is where it is because those villagers were not allowed to reach their potential. The system enslaved them - literally. Your elitist mindset - quite apart from an elite mindset - is another reason Pakistan is bottom of the barrel. When people you know end up swinging from poles, you'll know for sure how horrible those villagers really are. Of course it would never strike you to blame yourself and people like you. I know Grameen is not a charity. In Pakistan there have attempts on micro finance (Grameen style) but have not been successful. Few in Pakistan even remember their names while Grameen is known to most being a world wide sucess story. The obvious reason is that Pakistanis do not return loans; rather it is considered stupid to do that. The only self help of note is Orangi Pilot Project but that has remained rooted in Orangi since 35 years and has not been able to expand despite being their agenda. - Zakat fund. It was very widespread in Zia's time but over the years people have opted out of paying Zakat to govt. but still it is one of the biggest charities. - The much trumpeted Benazir Income support program of the present govt is a dole out. - To top all, madressahs which no charity in the world can match..
On false hopes, Hazrat Ali said "REMEMBER THAT WRONG HOPES AND DAY DREAMS WILL SADLY AFFECT YOUR MENTAL CAPACITIES, THEY ARE DELUSIONS AND ONE WHO BELIEVES IN THEM IS CHEATED AND DECEIVED." That was 1500 years ago. we should at least that be at that stage if not wiser now. In order to come to a solution, one must understand the problem first. You mentioned OPP by Akhtar Hamid Khan in Karachi as success. There are success examples in Pakistan, including Greg Mortenson's foundation setting up schools in northern areas and Agha Khan rural foundation setting microhydro projects. Both of these projects have heavy involvement of villagers who provide imputs such as land, sweat equity and run these projects as village organizations. I think serious efforts and determination do pay off. Pakistani villagers do want to help themselves. They want to live better lives for themselves and their children. What I mentioned above can be scaled to help more people, if they are not condemned to the lives they live now under a feudal/tribal system that denies them basic human dignity. People running OPP are my friends so I know the setup very well and all I can say is that it is surviving because of their high level of commitment, despite being threatened every time there are disturbances in Orangi. So while it is a success but that is despite the irresponsible attitude of the populace at large. Yes, there are very committed citizens who partcipate on a self help basis but they are a minority. Moreover, despite its success and the fact that OPP is very committed on training and fully capable of organizing such projects elsewhere in Pakistan, no such project has come up elsewhere. People by and large are not interested in improving their lot with self help. There are other success examples as well and these are many, eg, The Citizens Foundation (TCF) setting up schools all over the country, but that is with the proponents arranging funds and managing construction as well as operation of these schools; benefitting community inputs are very little. The same holds for Aga Khan Foundation. There are many other examples, eg, numerous hospitals giving free treatment. I'm not saying that nobody from the populace is self help oriented, but such people are a small minority. By and large our citizens do not take responsibility for themselves and demand of others to improve their lot when it comes to social uplift. Among the rich people, there are many who fund and manage social welfare projects but that is almost always on charitable basis; self help, community based are very few. The same mindset is reflected in the higher echeleons of governance. The present government being representative of the people is totally banking on charity to run the country, and not getting unpopular because of that. People do want to improve their lot and look for work opportunities to do so; that's every body for himself and it works. That's the reason for the exodus from villages to Karachi which is the only city with a vibrant self sustaining economy. But that is different from self help on community basis. 1. In USA gasoline is today at $2.39/ Gallon. Solar Power here will not make business sense until gasoline hits above $5/ gallon. I understand that in other countries where Gasoline is already above $5/G there is a lot of interest. This is because at this price break it starts to become attractive but is still an experimental interest not a practical one totally. All of Europe is still badly in need of gasoline and no country has become independent of it. 2. As for countries like Pakistan Shams' analysis is pretty much spot on. However, two things are further against Solar Power in Pakistan. One is Maintenance and spare parts and the other is dust. In Third World countries many new technologies fail because there is no infrastructure to support maintenance. Parts which will be imported will be cost prohibitive. Secondly, Solar panels lose efficiency quickly when they get covered with dust, which is a huge problem in the entire Sindh, Balochistan and Punjab. A thin layer of dust can bring down efficiency to about 50% within a few days after installation. So the 300, 000 MW power that Shams calculated will be down to 150, 000 MW. I do not think this is a viable technology for Pakistan. I personally feel that wind power has more potential than Solar. The issue is how to get power to far-flung villages that have no prospect of getting connected to the national grid over the next 5-10 years. Grameen model has demonstrated that p.v. solar technology backed by an org like Shakti that provides microfinancing, support and training can improve the lives of such villagers in a relatively short period of time. All of the other models/calcs comparing solar to other technologies are not relevant here because of the massive infrastructure cost, time and involvment of an incapable government. Here is a little calc specifically to your last point. Two fans and 5 hours of two 15-W lamps will require 8000 Watt-hours per day. If sun is up and up daily for 8 hours, and with in-field efficiency hit ratio of 1.15, I will need at least 1,150 watts of solar panels. Solar panels cost about $7 per watt. Batteries cost 30% of total. So the Khorean system should cost nearly $10,000, plus cost of installation. That is Pak rupees 800,000 plus installation, plus maintenance. The parent company Grameen Bank provides low-interest finance and, for a solar home system that has a life of 25 years, the customer can chose to pay 10% to 25% upfront and the rest in 24 to 42 monthly installments at a flat service charge of 4% to 6%. The total cost of a 50-watt solar home system –the most popular size – is $400. A 50-watts solar system can power four to six low-energy lamps, radio, TV and mobile phone charging. Depending on their needs, consumers can chose a capacity ranging from 10 watts to 75 watts. A bio-gas plant can cost from $215 – good for an individual household – to $1,400, enough for supporting a cluster of homes. They range from 1.6m3 to 70m3 of bio-gas production. Here is why I think that data is dead wrong. Add solar recovery at 1.15, or 165 watts of solar panels, just for TV. Cost of solar panel at factory outlet, $7/watt. That is $1155, for tv alone, and there is no battery yet. Add the battery and it goes to $1500. A 50-watt solar panel will output about 50/1.15 or 43 watts to a battery, or about 350 watt-hr worth of juice per day. Anytime someone sends me information presented on the Internet, I do at least basic cross checks. If the it makes sense, I buy it. Sorry, but this s--- cannot fly. Instead of doing back of the envelop calcs with hypothetical numbers, Grameen is actually implementing this stuff successfully in tens of thousands of village homes each year in Bangladesh. That's why Mohammad Younus is considered a genius and worthy of a Nobel prize. Apparently, their "can do" attitude is what the poor need rather your "can't do" excuses. That's how Grameen Shakti has become a profitable company. It's doing well and doing good at the same time. That's the kind of social entrepreneurship Pakistan needs to get rid of deprivation and poverty that breeds radicals and terrorists. If you are really serious about understanding how Grameen does it, please do some research on the company and its model. Being a villager myself, I do take point to Suhail's comment of us "being useless lot". Moving on, once we go beyond pointing fingers to everyone - from government being ineffective and people not paying loan (as one of the comment said), we do have potential to introduce Grameen like scheme. I am interested and would like acquire networks. Do you have any information on "SK"? I am currently working on a feasability study to build a solar module plant in Pakistan. Solar systems (ready to install) cost $7/watt in japan. Chinese solar systems can be bought for $3-4/watt (low quality and no guarantees) and Taiwanese/Indian are somewhere in the middle. I am working on importing German A-grade cells and assembling modules in Pakistan as that process does not require sophisticated technology. Cheap labor, glass, inverters, batteries are all available in Pakistan at competitive prices. A solar system ready to be installed is possible at $3-4/watt (far less than suggested by some on this thread). What is needed is government support and agreements with WAPDA for net-billing. I would like to discuss my plan with you and your thoughts on it. It seems to me that Pakistani made solar modules for export and domestic use is a viable option. I agree with the idea of "integrating" cells into panels. However, I would not paint origin of manufacturers with "wide paint brush". That is, not all manufacturers in China have "same" quality - some are much better than others. For example, the Sun Power Corp (US company. http://us.sunpowercorp.com) has factories in Philippines that make higher quality of cells than almost anyone. Therefore, instead of using word like “quality” (I know I used it too) we should look at specification like: Efficiency, Degrading, (e.g. 22%, 30 years warranty to produce 90% or better than initial, etc.) I would like to invite all to my blog (http://solarpoweredpakistan.blogspot.com/) where I have more information. Thanks for your comment Aziz. I certainly did not mean all Chinese cells are of low quality. I just wanted to provide some reference. There are certainly great things coming out of China - it has a successful wind generation program (technology) relative to Japan for example. There is definitely a stigma attached to Chinese brands and it is necessary to aggressively siphon between the good and bad. Hi, What can I say. Solar Energy is the only thing that will make a difference in Pakistan's development. I want to be the part of it. I have the time and courage but what i dont have is the knowledage what to do? I feel like a person who has the ingredients to make a soup but don't know how to start.My email address is uzmaaaqib@yahoo.com. I ask for your help. Help me to help my nation, my country. Uzma, "I ask for your help. Help me to help my nation, my country." I really admire your enthusiasm. My suggestion is to first read up on and understand the Shakti model in Bangladesh, then try to hook up with a persuade some of the microfinance folks in Pakistan to let you lead the effort. Thank you so much for this blog. Absolutely loved it. Also liked healthy debate from both standpoints. I've started studying Grameen Shakti and would like to discuss it with you. Is there any email or phone no. I can reach you at? J. Iqbal: "I've started studying Grameen Shakti and would like to discuss it with you. Is there any email or phone no. I can reach you at?" Iqbal Sahib, Please leave me your email address and I'll contact you. Pakistan People's Party led coalition government has opted the option of using Rental Power Plants (RPPs) to overcome persistent electricity crisis that is not only causing great amount of hardships for the fellow citizens but also hitting hard to country's economy. There is much hue and cry from political and other circles over alleged kickbacks in deals of RPPs. Pakistan Muslim League-Nawaz has already announced to issue a White Paper on RPPs while another opposition party-Pakistan Muslim League (Q)- is also at the forefront in highlighting alleged wrongdoings in the execution of RPPs. Sources in PEPCO told PAGE that RPPs would provide electricity at a quick speed compared to IPPs which will reduce power deficit on an emergency basis. These rental projects are for five years and its costing responsibility rests with private sector investors. The contract life of these projects is between 3-5 years, after which the government has no obligation to purchase power from these units. According to them, it is incorrect to suggest that rental power costs are substantially higher than that of IPPs. Due to different tariff of rental plants, even after taking into account the high fuel costs, the cost difference is almost equal or marginally higher in case of RPPs. Compared with IPPs, RPPs power generation cost ranges between 12-13 cents per KWh, and IPPs' power generation costs approximately 12 cent per KWh. Government circles are of the view that mere blame game is going on just for the sake of leg pulling. There is nothing wrong in RPPs and the only viable option to get rid of load shedding is rental power plants, they believe. They said rental tariffs for the projects depended on number of factors including location of the plants, system maintenance, and consumption of fuels. Others factors are variation in project cost due to difference in technology, age of machinery, and variations in financing. As many as, 14 approved RPPs with total generation capacity of 2250MW will start functioning by December, which would expectedly end the energy crisis. However, critics of RPPs are of the sanguine view that highly controversial RPPs are proving last resort to overcome the power crisis, which has hit hard the economic growth of the country besides adding salt to public miseries at large. The political government has surrendered to public pressures on construction of Kalabagh Dam, the only way to survive ahead and instead preferred to go after a stopgap arrangement at a higher cost. The independent experts are of the view that RPPs would not only fail to meet rising electricity demand but also burden the national exchequer in general and power consumers in particular. The public is justifiable in questioning that if RPPs are the option, why it is adopted too late. According to Pakistan Electric Power Company (Pepco) Managing Director Tahir Basharat Cheema, an investment of around US $2 billion is expected in power sector through RPPs. Apart from investment in power sector, additional electricity of 1675 MW will be added in the system by December 2009 when nine rental power projects will start generation. However, overall 2250 MW electricity will be generated through RPPs in current fiscal year (2009-10). Two rental power projects that have already started generation include Atlas Power (213 MW) and Attock Generation (156 MW) while remaining seven will start functioning by December 2009. These RPPs include Nishat (196 MW), Engro (203 MW), Saif Power (213 MW), Fauji Foundation (176 MW), Sapphire Electric Company (213 MW), and Orient Power Company (213 MW). He said all proposals of RPPs were accepted only with bid bonds and performance guarantee by sponsors. Two questions: why have some private power producers completely shut down? Why are private power producers operating way below their full generating potential? Two answers: political score-settling plus the circular debt. We at the Centre for Research and Security Studies (CRSS) have been trying for months to ascertain the crux of our power politics. Almost all roads lead back to the government. The federal government is the largest power defaulter, then come the four provincial governments, FATA, the KESC and the KW&SB. This is how the circular debt explodes into even bigger circles: the federal government does not pay its electricity bills to Water and Power Development Authority (WAPDA). WAPDA is then unable to pay for electricity it buys from IPPs. IPPs are then unable to pay for their oil supplies. Refineries, short on cash, are unable to pay their foreign suppliers. Grow, grow, grow and we have a Rs200 billion time bomb. Welcome to the rental power bonanza; the government’s ingenious – canny, crafty and cunning – all-in-one solution for the crux of our power politics. What we need to do is to re-start the power producers that are shut down. That’s 800 MW at US 11 cents per MW. What we need to do is to resolve our circular debt puzzle. What we need to do is to get our sugar mills connected to the national grid which could generate an additional 2,200 MW at less than US 11 cents per MW. Aides of Finance Minister Shaukat Tarin said he almost resigned after failing to persuade the cabinet against renting, an option he considered expensive and inefficient. Here are some questions and answers about the plight of the power sector in Pakistan and leasing plants. Pakistan has about 20,000 MW of installed power production capacity, but that falls short of demand by roughly 4,000 MW. Lengthy power cuts, dubbed load shedding, have become commonplace. Past governments failed to anticipate the growth in demand and delayed clearing power project proposals and big dam projects that would have boosted hydro power. Lack of investment in existing plant, outdated grids and rampant electricity theft mean that some grid companies experience line losses of up to 30-40 percent, analysts say. Many independent power producers (IPPs) operate well below capacity because they cannot pay their fuel bills regularly as grid companies owe them money. The crisis has crippled industry, notably textiles, the main export sector and largest employer in the manufacturing sector. There have also been violent protests that some analysts see as a bad omen both for the government and democracy in a country struggling to contain the growth of Islamist militancy. WHAT IS BEING DONE TO BOOST SUPPLIES? The 18-month-old civilian government has vowed to increase supplies but needs huge finances. It recently reached an agreement with the World Bank and Asian Development Bank to phase in power tariff increases. The government is working on a multi-pronged strategy to address the problem through building new dams and setting up new permanent power plants. It sees Rental Power Plants (RPPs) as the "only solution", while completing medium and long-term projects. WHAT IS RENTAL POWER PLANT? Countries can hire power units from overseas manufacturers that can be shipped in kit form and installed. It takes four to six months to set up a rental unit, while two to five years may be needed for an Independent Power Producer to build a plant. Surging emerging economies like China and Turkey have gone the short-term rental route to bridge power supply gaps. And Pakistan, according to official documents, had two rental units commence operation in 2007. Under the new plan, additional RPPs would be set up to generate 2,250 MW by the end of the year. HOW WILL RENTAL POWER PLANTS IMPACT FUEL DEMAND? The rental power plants would increase the Pakistani power sector's furnace oil needs by 29 percent, driving up its import bill and adding to pressure on the rupee and currency reserves. Pakistan requires 35,000 tonnes a day to feed its thermal power plants and the installation of the RPPs will increase demand to 45,000 tonnes, officials say. The country imports about 80 percent of its oil. It spent $9.5 billion on the import of 10.6 million tonnes of petroleum products and 7.8 million tonnes of crude oil in the 2008/09 (July-June) financial year. Rental plants can provide breathing space for Pakistan to focus on medium- and long-term projects. Advocates say rental plants are efficient, will help quickly meet growing needs, and end-consumers will pay the same or a bit less for their electricity. Opponents say the mostly second-hand equipment will be less efficient and that the tariff will rise. They argue that the government would be better off spending money on upgrading and using idle existing capacity. Some opponents also say the option is being supported by corrupt politicians hoping for kickbacks. ISLAMABAD: The multi-million dollar mystery shrouding the serious shortage of gas in the country, which has already led to twice a week closure of CNG stations, seems to have finally been resolved, as millions of cubic feet of gas per day is now being supplied to powerful owners of the controversial rental power plants in the country as the Economic Coordination Committee of the Cabinet meeting on Tuesday (tomorrow) has been asked to approve additional supplied for these plants. The official sources said these expensive rental power plants, which were being installed with tall claims to address the energy crises in the country, were said to have now become one of the major reasons behind a new sorts of energy crises in Pakistan, as their gas requirements are bound to hit other sectors of economy running on gas supplies. The cement sector has already been hit as its gas supply is now being diverted to one such power plant at Naudero. Under the agreed deal which was subjected to criticism both within and outside the Parliament, these rental power plants will continue to get gas supplies for five years till the completion of their agreements with the Ministry of Water and Power. The formal approval of this gas supply is being given in the Economic Committee of the Cabinet (ECC) meeting tomorrow (Tuesday). Finance Minister Shaukat Tarin will preside over the meeting as Petroleum Minister Naveed Qamar is out to get the approval for these plants as proposed in the official summary of his ministry. The sources said the supply of gas would become a huge issue in the coming days for even the domestic consumers after the government would divert more gas to these rental power plants after diverting it from the sectors which were now regularly getting the supplies. Now ECC was asked to give supply of gas only for one plant. Sources said, more demands from other power plants will soon follow and then the country would really experience the burden of these power plants, which were ironically being installed to address the very energy crises of the country. The official papers to be laid in the ECC meeting revealed that the gas meant for the cement sector in particular was being drastically reduced and diverted to the rental power plants in the country. One source said, certain other sectors which are already getting the gas in the country soon may also face similar kind of cuts in their approved supply to accommodate the privileged and powerful owners of the plants having direct links at the top levels. The huge gas supply is being supplied as a part of deal struck with these rental power plants by the Ministry of Water and Power in controversial circumstances. According to the official papers to be tabled in the ECC meeting, the Ministry of Petroleum was now seeking the approval of diversion of gas from cement to power plants and initially a power plant of 51 MW was being provided with 30MMCFD. The papers said earlier the ECC has decided on October 2 to place 12 MMCFD gas from SSGC system at the disposal of PPIB/Ministry of Water and Power for five years for power generation in accordance with the natural gas allocation and management policy of 2005. The official summary said the Ministry of Water and Power have now informed that 12 MMFCD gas been allocated to the power plants project. The summary said, based on SSGCL commitment, it is proposed that 15 MMCFD additional gas from SSGCL system which includes diversion of 14MMCFD gas being supplied to cement sector may be placed at the disposal of PPPB/ Ministry of Water and Power on the “ as and when available basis for five years” for power generation subject to following conditions. Chinese have become master manufacturers-builders and their equipment and contractors are so affordable that even India is using them for a large number of power projects. "India wants to boost electricity output by 60% in the five-year span ending March 2012 to alleviate severe shortages and help fuel a rapidly growing economy. But it doesn't have enough of its own equipment and engineers to meet that goal, so power companies have looked overseas for help. U.S. and European suppliers are too expensive, but low-cost Chinese contractors are a good fit. Chinese companies are now supplying equipment for about 25% of the new power capacity India is adding to its grid, up from almost nothing a few years ago. They have sent thousands of skilled workers to Indian plant sites, some of which boast Chinese chefs, Chinese television and ping pong." Thank you for such valuable information. I have a small addition to make when talking about solar systems. I have been living in pakistan and want to go solar for a while now but something that scares me more than the upfront one time cost of solar panels is the maintenance cost for batteries required once it is installed. Ideally i would like a Grid Tied system which is not dependent on batteries but when i contact solar dealers they dont offer such solutions. the only solutions they have is batteries based. Additionally while discussion with some friends, something came up which was like, can we meter the solar system power generation ? Like how many units did the solar panel generate in a months that would really help measure exact savings in comparision with national grid. I would really like some posts from you and other experts which explain how to install solar systems without batteries and which appliances can be used with it. "In 2002, just 7,000 households were using solar panels but now more than a million households -- or some five million people -- gather solar energy, said Nazmul Haq of the Infrastructure Development Company (IDCOL). The number of households in electricity-starved Bangladesh using solar panels has crossed the one million mark -- the fastest expansion of solar use in the world, officials said Wednesday." The Islamic Development Bank (IDB) ) on Monday announced its commitment for $850 million support for development projects in Pakistan. According to a release, the support was announced as a five member IDB delegation headed by the institution’s vice president Birama Boubacar Sidibe called on Finance Minister Ishaq Dar in Islamabad on Monday. Sidibe said that the IDB was prepared to disburse $850 million dollars in addition to the 750 million Euros in support and the $150 million in trade assistance it had approved and started paying in August. The fresh project assistance to Pakistan will be provided over the next three years. The IDB VP informed Dar that he expects project Pakistan plans to undertake in future would make IDB one of its largest operations. “Your priority is our priority” said Sidibe. In addition to the financial assistance, Sidibe said that the IDB was also ready to constitute consortiums for financing projects in Pakistan. The finance minister said that Pakistan looks forward to stronger and better economic relations with IDB in the future. Sidibe added that Pakistan is an important member country of the IDB. He added that Pakistan’s support of the agency had played some part in helping it secure a AAA ranking from international rating agencies. Dar briefed the delegation on status of ongoing power projects in Pakistan including the 969 MW Nelum Jhehum Hydropower Project which the IDB is financing. The finance minister hoped that the project, whose cost had tripled due to neglect of the previous government, would be completed by 2016. Similarly, work on the 425/525 MW Nanidpur Project, which had been delayed for over three years, had been started in full swing. Additionally, Dar said that the government is working to add 10,000 MW of generation into the national grid and is presently working on the 2117 MW Karachi coastal project and 6600MW coal fired thermal Project in Gadani. He added that the government was also working on the parallel projects of Diamer Basha Dam and the Dasu Project. ISLAMABAD, Pakistan (Thomson Reuters Foundation) – After months of sleepless nights and uncomfortable days in sweltering heat, Hussain Raza has found relief. But it’s not just the cooler winter weather that is making Raza happier. It is, somewhat ironically, the sun. The 35-year-old banker and his family have bought a solar-powered electricity supply that kicks in during the frequent power outages that afflict even his upscale residential neighbourhood in Islamabad, Pakistan’s capital. A chronic shortfall in electricity in Pakistan makes life miserable for much of the country’s population and hampers industrial growth, experts say. Until he bought his 300-watt solar energy system in October last year, Raza and his family often had no electricity to keep the lights on in the evening or run a fan during hot nights. “How can I be at ease seeing my children go to school without homework (being done) and feeling sleepy in school due to inadequate sleep at night?” he asked. “Now I feel really relieved that I have a solar energy system that runs two fans that give us a good night’s sleep,” he said. Mounted on the roof of his two-storey house, the solar installation stores energy in a battery that can power two fans and four 23-watt energy saver light bulbs for 10-12 hours through the night. Apart from the comfort and convenience the system provides, Raza’s monthly electricity bills have dropped from around 4,500 Pakistani rupees (about $43) to less than 2,800 rupees ($27). “It is worth the bill we paid for the renewable energy system,” he said. The kit cost the equivalent of $560, he said. Power outages in Islamabad have been a problem for more than seven years, in part because of rising electricity demand due to the increasing size of the city’s population. Pakistan’s daily power demand averages 16,000 megawatts (MW), but the country produces only around 12,000 MW. This shortfall can soar to 7,000 MW during peak summer months. As a result, power authorities must resort to load shedding for more than 15 hours a day in the summer months, and six to eight hours daily in the winter. Buksh Foundation through its unique approaches is trying to fill the gap in the microfinance industry; it is trying to cater to the commonly faced problems by the majority of micro-enterprises of the Country. Foundation is directly impacting the lives of growing number of poor people throughout Pakistan living in peri-urban and rural areas of Pakistan. In the escalating energy challenge of the Country, when there is lack of access to affordable and reliable energy sources Buksh Foundation emerged with its innovative solutions to cater to the growing needs of the energy impoverished communities. Buksh Foundation laid ground for its Clean Energy Loan program in 2010, today; clean energy lending is one of the fastest growing areas of Buksh Foundation’s total portfolio. Currently, the program facilitates its clients with the help of three different portable solar generators that are a complete solar home solution, a solar kit fan and a solar lighting kit, that the organization has developed with the help of its sister concern Buksh Energy Pvt. Ltd. and has a team of trained staff which has the required skills and expertise. Solar portable generators integrate photovoltaic modules, battery storage, and other balance of systems (BOS) components with a simple control interface, the solar generator is light and compact and can be transported easily from one place to another. To date, 770 energy loans have been disbursed at 6-12 month easily installment of about PKR25,000 in order to support the cottage industry of the Country and provide sustainable income generation. Clean energy investor and solar energy provider Clenergy has won a contract for 40MW of mounting systems for the 100MW flagship Quaid-e-Azam solar energy park in Pakistan. The solar park will be located at Bahawalpur and Clenergy is cooperating with Chinese company TBEA SunOasis which is providing engineering, procurement and construction (EPC) services for the project. Clenergy is known globally for its PV-ezRack mounting system range which has been deployed in multiple utility-scale PV power projects around the world. The two companies have been collaborating in utility-scale solar projects since 2011 and most of the partnership’s large-scale installations in China’s northwest desert region utilise the Clenergy C-steel mounting system. The 40MW contract in Pakistan marks the partnership’s first cooperative project beyond Chinese borders. Pakistan is currently suffering an energy shortfall of 6GW with demand rising by 8 percent annually. The government of Pakistan is hoping to extend the Bahawalpur project to 1,000MW spread over 6,500 acres of land. Pakistan's northern Khyber Pakhtunkhwa province plans to supply solar power to 5,800 off-grid households in 200 villages, promoting clean energy amid conventional electricity shortages. The provincial government has earmarked 400 million rupees ($3.94 million) for the nine-month solar project, which will equip up to 29 households in each village. The scheme is part of the Green Growth Initiative launched a year ago in Peshawar by former international cricket star Imran Khan, who is chairman of the Pakistan Tehreek-e-Insaf (PTI) party, which governs the province. The initiative aims to boost economic development in a way that uses natural resources sustainably, by increasing uptake of clean energy and forest cover, for example. The provincial government plans to hook up at least 10 percent of the 40 percent of the province that is off-grid in the next three years with solar power and small-scale hydroelectric plants, said Atif Khan, provincial minister for education, energy and power. It is already setting up micro-hydro plants - which harness running water and do not require dams - in the mountainous north of the province, while off-grid households in the south will be provided with solar energy. The government will pay 90 percent of the cost of the solar equipment, with the rest shouldered by households. Families will receive a 200-watt solar panel, two batteries and other accessories to run a ceiling fan, a pedestal fan, three LED lights, and two mobile phone charging slots. In total, the project will generate 1.2 megawatts (MW), in the first stage of a wider plan to provide all off-grid households in southern Khyber Pakhtunkhwa with solar energy. Across the province, total demand for electricity in grid-connected areas is 2,500 MW, but they receive only 1,600 MW from the national grid run from Islamabad, the country's political center. “We will exploit renewable energy resources and produce our own electricity, after which we will not need to beg from the center,” said Imran Khan. “The government should start building small dams in the province as this would not only help generate enough electricity but also provide water for irrigation and drinking,” he (ANP's Senator Zahid Khan) said. Module manufacturer Aleo Solar enters the Pakistani solar market in cooperation with energy provider GreenIndusTree. Electricity supply in Pakistan is very unreliable and for this reason many households use diesel generators during the daily power failures that last several hours. To solve the problem of energy shortage, Aleo Solar now delivers PV-modules for 18 solar plants with an overall performance of 100 kW. With solar power, households are able to produce power sustainably as well as reducing fuel costs, while depending less on them. "Power cuts are a daily occurrence in Pakistan, even in major cities – and both industry and private homes are suffering as a result. The country has a population of around 200 million and is one of the up-and-coming emerging markets in Asia, but the demand for energy cannot be met.”, reports Dr. Kaiser Chaudhary, Managing Director at GreenIndusTree. Comparing peak demand and maximum installed capacity, the country suffers from a rather large energy deficit of up to approximately 6 to 7 GW. "We want to provide homes and companies with solar storage systems as a quick and independent power supply", continues Dr. Chaudhary. The solar energy systems – which also contain 278 modules by Aleo Solar – were chosen as they are said to run efficiently, even under the extreme climatical conditions in Pakistan with outdoor temperatures of up to 45 °C. Starting in April, GreenIndusTree will install the 18 solar power systems in Lahore, the second largest city in Pakistan. To help the homes achieve independence from power cuts and the availability of diesel, GreenIndusTree furthermore uses solar storage systems with a capacity of 5 to 10 kWh. "The current solar projects are just the beginning", explains Günter Schulze, Managing Director at Aleo Solar. "The energy consumption in Pakistan is increasing continuously and is predicted to reach 35 GW by 2018. The many of hours of sunshine and the favorable irradiation angle make Pakistan perfect for using solar power." A feed-in tariff for private homes will be announced over the next few weeks. Since the beginning of 2014, NEPRA, the electricity regulatory authority in Pakistan, has promoted the solar power input from PV plants with a capacity between 1 and 100 MW. The feed-in tariff depends on the location of the plant, due to differences in solar radiation. In the north of the country, every kW/h fed in will be reimbursed with around 22 Pakistani Rupees (PKR) for 10 years, which corresponds to around 15 €-ct. After this time, system operators will receive PKR 9 or 6 €-ct. for 15 years. In the south, the feed-in tariff will be PKR 21 or 14.6 €-ct./kWh, followed by PKR 8.7 or 6 €-ct./kWh. The United States Agency for International Development (USAID) on Friday partnered with five banks to lend an estimated $88 million for the development of clean energy sector in Pakistan. The US Consul General Karachi Grace Shelton presided over the signing of a partnership agreement between the USAID and Habib Bank Limited, MCB Bank Limited, Faysal Bank Limited, Meezan Bank Limited and JS Bank Limited. Under the 15-year partnership, the U.S. government agency agreed to settle half of the total bad loans. Approximately, $88 million in financing will be available to support the development of the clean energy sector. Partner banks will be able to provide debt financing to small-scale clean energy projects undertaken by developers, companies or households. The loan is for purchasing energy equipment. Hammink said the facility is expected to significantly improve access to financing for the smaller scale projects and encourage private investment in clean energy. Working with other US agencies, as well as donors and international development partners, USAID has focused its program over the last year on five areas essential to Pakistan’s stability and long-term development and reflective of Pakistani priorities: energy, economic growth, stabilisation, education and health. Over the last year, USAID has streamlined the number of projects from approximately 150 to less than 70 and has also chosen to implement over half of all funding through local organisations in Pakistan – both government and non-government.